You have to take the stairs. You have no option. The stairs are damaged and you try your best. You fall and you are seriously injured. You aren’t sure what happened or even why. You just know that you are really hurt and don’t know what to do. Is the building owner responsible? Even if you cannot testify to exactly what made you fall? The answer is yes. In the premises liability case of Christakis v. Tivioli Terrace LLC, the Fourth District Court of Appeal held that it was an error for the trial court to enter a directed verdict in favor of the defendant where there was conflicting evidence as to causation. In this case, the plaintiff could not testify to what made her fall. However she did produce evidence in the form of photographs and expert testimony that the stairs were damaged. The Court ruled that the plaintiff was not building inference upon inference because the damaged stairs were proven fact through the photos and testimony. As such there was a conflict in the evidence which should be left to a jury to decide. 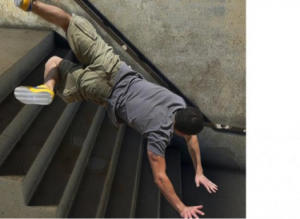 Citations for Unsafe Conditions: Finding out if a property owner has a history of defective stair incidents or has previously been cited for having an unsafe environment by the city, county, state or federal regulators would be ideal in a Florida slip and fall claim. Any type of report indicating a proprietor/manager/owner knew of an unsafe or dangerous condition on the premises (actual notice) is decisive evidence for Florida broken or defective stairs claims. Digital Media: If your accident was caught on camera by photographs or videotapes, your case is that much stronger. This is why we encourage photographic and video recorded documentation of the accident and scene with your phone or camera enabled device as soon as possible after it occurs. Checking with eyewitnesses and those who were in the surrounding location of the accident may result in a visual recounting of the incident to back up your words. Witness Statements: Interviewing any eyewitnesses to the incident can help substantiate your case. Also checking with the property owner’s employees; contract workers; delivery personnel; or other types of individuals familiar with the premises may prove beneficial to your cause. Corroboration is the goal here. These eyewitnesses may likely be able to corroborate the hazardous circumstances and conditions on the property that led to your slip and fall and thus help establish whether they were commonly understood and recognized. Photographs: Photographs of the condition that caused the accident can be used to show a jury or insurance adjustor that a condition is dangerous. Also, an expert can use them to ascertain whether or not a specific condition fell below the applicable ADA, Florida Building Code, or other codes designed to protect someone similarly situated like the Plaintiff. 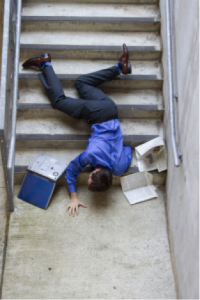 If you fall on broken stairs, don’t immediately assume that it’s your fault. It is possible after a proper investigation that the stairs do not meet the Florida Building Code. It is also possible that the property owner has been cited for violations and has failed to repair the defective stairs. That is why it is essential that you speak with your personal injury lawyer as soon as possible. Wolfson Law Firm is a Miami personal injury law firm located in Miami, Florida that helps people injured from broken or defective stairs. 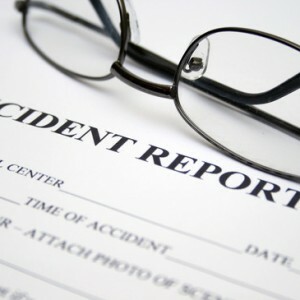 We practice entirely in the field of all types of accident, injury, and wrongful death cases. The firm routinely accepts trial referrals. It is a boutique law firm that represents clients, giving them the utmost personal attention. Wolfson lawyers help clients in all parts of insurance, injury and wrongful death claims, handling cases from initial investigation, through trial, and even appeals. Call us today for a free evaluation of your case at (305) 285-1115.